I have many photos to share now that we are back from our European trip. The weather was perfect, summer-like each day – not one drop of rain! 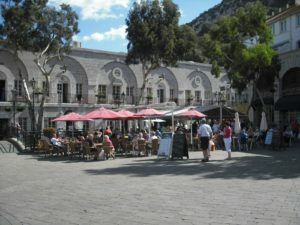 Gibraltar, UK was our first port of call. We have been here before and this time decided to “not” take a shore excursion, but rather wander around town, investigating new sites, taking in the shops, sights and “smells” of possible new pastry ideas. Just prior to visiting the cafe, we did come across a confections shop offering some chocolates and pastries – a fairly impressive dessert case for where we were (this is not Paris folks!). We made it our goal to take photos of “all” the pastry shops we came across – to later compare. This is the first of many…. Please check back soon, as I will be more diligent about my “postings”. Do I have my favorites when it comes to countries? Yes…..France, Italy, Spain and Portugal, my new favorite (more to come on this amazing country). 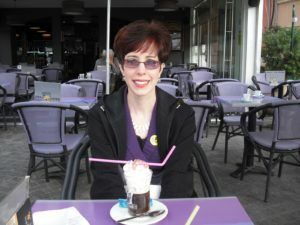 I had to post this photo first……our first “real” cappuccino…in Sanary-Sur-Mer, France….just beautiful! All of the coffees in Europe are nicely brewed, but this was my favorite so far…..mounds of whipped cream:) The downside…..only 45 minutes leisure time on this shore excursion to enjoy the shops and coffee…..but it was worth it! 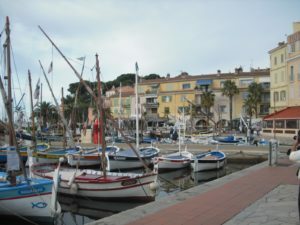 This seaside town is brimming with boats and quaint buildings shops and cafes, resembling those in Villefranche, France along the the French Riviera. This was the beginning of our venture to find new pastries and delicacies in Europe. 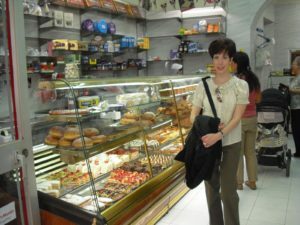 We found one-of-a-kind shops, brimming with authentic (seen only in magazines at home) pastries, confections, glace fruits….I was in sheer ‘baking heaven’…to say the least! Check back frequently for more photos of our trip, as well as ideas for new European cookie offerings! These are some of my latest designs for “The French Macaron”….a fussy little girl of a cookie confection, I must say:) The longer you have been baking them, the better your track record for success. Once you become confident enough in making the basic shells, you tend to want to explore variations on the shell’s color and decorations, as well as what goes inside the shell itself, be it tea leaves or spices. The possibilities are truly endless. 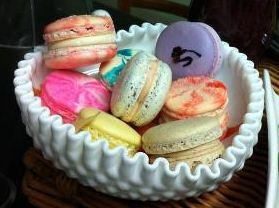 I have been asked for weddings, showers and birthday parties to design the macarons according to event theme and color. Most anything is possible! I have to give credit to my sweet husband, Stephen, for encouraging me to “keep at it” when I first started baking them. They truly test your patience, but like with anything, persistence pays off:) Be sure to comment on what you would like to see in the future in terms of flavors and colors! Well, it’s surely “my” time to start thinking about the holidays, as it pertains to creating, baking and detailing cookies. I continue to offer the “favorites” in addition to newly inspired ideas. I am constantly looking at not only baked items, but enjoy wandering through boutiques and shops for new ideas on flavors, colors and textures. The photo gives you some insight into “what’s new” in my kitchen. 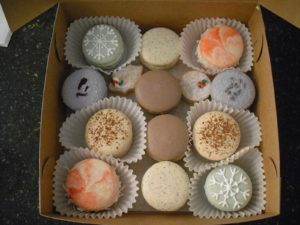 I will be offering “Spiced Chai” French Macarons dusted with cinnamon for fall and a great Eggnog buttercream to be tucked neatly inside of any macaron of your choice – albeit the “snowflake” design you see or the “swirly” red/white design. I know some of you like “all things French” as I do, and can also request dried edible lavender for the tops of the macaron shells. Any buttercream will complement them nicely:) How about edging the macaron with sweetened coconut? I think it looks like “snow”. Or large-crystal sugar on the tops to look like an icy-wintery scene? The possibilities are endless…truly. And of course the Buttercream Coins can take on many other forms – like the holly leaf shape. See it hiding in there? So it will soon be “your time” to start thinking about the holidays…..it’s never too early. I get booked quickly, so please think ahead about your holiday events coming up or giving a gift of “sweetness” to your special friends or family. I look forward to making your gatherings special this season! 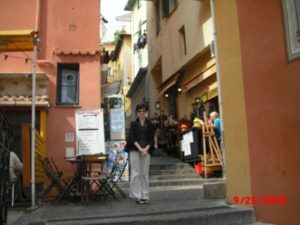 This photo was taken in Villefranche, after walking up and down the hilly landscape, moving in and out of narrow cobblestoned streets, peering into lovely cafes and shops….C’est si bon! France was the beginning of my inspiration for baking. Our visit this fall will be mostly leisure, but we will surely be sampling and tasting our new “finds” – pastries that are either hard to find or nonexistent in our area. I’ll be sure to share what we discover!